When planning a wedding, a bridal shower can be the last thing you want to think about. 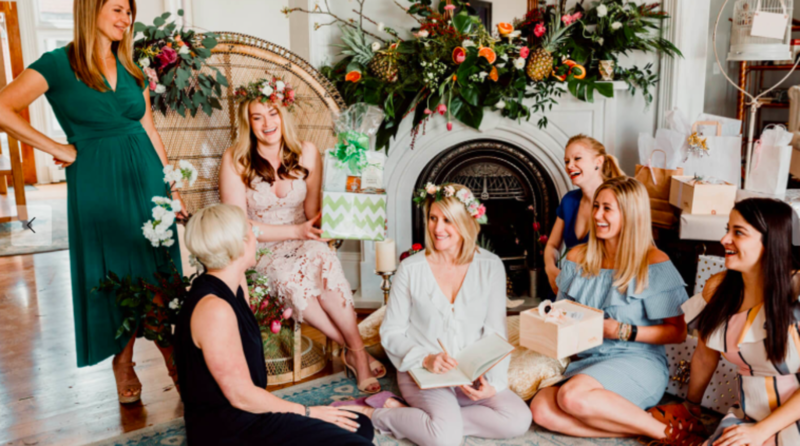 Luckily, there are plenty of Saratoga vendors out there that can help with every detail of planning a wedding shower, from decor to catering and more. Saratoga is well seasoned in the hospitality industry and has countless options for you event regardless of the party size or budget. Formerly the Congress Spring Bottling Plant and Congress Hall, a large resort hotel, the Canfield Casino is now a national historic landmark. Located inside the beautiful Congress Park, (which is situated in the heart of downtown Saratoga, bounded off by Broadway, Spring, and Circular street) the Canfield Casino is a hotspot for weddings, wedding showers, banquets, and more. The dining room and ballrooms are available to rent for your special occasion. The Casino is owned and operated by the City of Saratoga Springs, and can be booked via the Casino Coordinator. Not only can you enjoy the enchanting Canfield Casino you can also choose to separately rent the Congress Park Carousel, conveniently located right next door! The historic wooden carousel is just the magical touch every special day needs! The Gideon Putnam, located inside the quiet, and quaint Saratoga Spa State Park, is a historic hotel and spa known not only for its history but also for its picturesque charm. Recently re-constructed, the Gideon Putnam is a popular go to as far as event spaces are concerned in the Spa City. This is a space perfect for any wedding shower, whether you’re looking for a laid back, intimate affair, or would prefer more of a gala like soiree. Choose to host your shower in the appropriately themed wedding reception room, grand ballroom, or the recently added outdoor pavilion. Your event, whether it’s an intimate party, a lavish reception, or an important business meeting, will be as effortless as it is memorable. Start planning your event by emailing Shelly.Lindsey2@Hilton.com. Boasting a downtown address that is as convenient as it is current, this Saratoga venue impresses on all accounts. Design a flexible meeting or event in the Skidmore Room featuring natural light for an inviting atmosphere. This space is great for group dinners, showers, cocktail receptions, and birthday parties! When’s the last time you enjoyed the romance of Longfellows? At Longfellows, weddings are a specialty, and they promise an exceptional experience. The stunning inn is a sought after event space, often for weddings, making it the perfect location for your wedding shower! If the cuisine isn’t reason enough to consider Longfellows as your wedding shower location, maybe the aesthetic will convince you! The atmosphere, and decor is unparalleled. A destination for not only locals, but couples world-wide, the Hall of Springs adjacent the Saratoga Performing Arts Center (SPAC) needs to be on your list of possible venues. The stunning decor is fit for a prince or princess, and their very own wedding planners are ready to give you your dream shower. The Hall of Springs also works exclusively with Mazzone Hospitality. Mazzone has over 30 years of experience in the hospitality industry. The company, known for their weddings in particular, provides top notch service to all of their clientele. Leaning more toward an outdoor event? The Polo Fields at the Saratoga Casino Hotel may be the perfect fit for a lovely outdoor affair. The event spaces are available from May through early October. Four different spaces are available, the first being the “Lodge Tent”. The Lodge Tent is situated on the front lawn of The Lodge, and holds up to 200 people. The “Outdoor Hotel Terrace” includes the use of the terrace, patio, and fire pit. A tree lined field known as the “Polo Meadow” is an option for larger parties. The area is generous, allowing for tents with a larger capacity. Last but not least is the “Polo Field”. This 300,000 square foot space is the perfect outdoor setting for a party of any size. Whether you are looking for an indoor or outdoor space, Saratoga National Golf Club is certainly in the running. Designed by Roger Rulewich, a renowned golf architect, the Saratoga National Golf Club has been rated one of America’s Best Golf Courses by Golf Digest. The scenery is stunning with a brilliant backdrop filled with bridges, infinity pools, lit fountains and ponds. Not to worry, the indoor decor is just as decadent with unique chandeliers, as well as custom artwork and woodwork. Prime at Saratoga National is the onsite caterer, with over 35 years of experience catering the best of Saratoga weddings, events, and galas. Does a rooftop shower sound like it’s up your alley? The Pavilion Grand Hotel may be the new kid on the block but it rivals many other Saratoga hotels. Though it may not have historical ties to the city this particular hotel is conveniently located right off of the famous Caroline Street, and is refreshingly modern. Enjoy a hip atmosphere, while providing your guests with a great experience. Fish at 30 Lake located inside the hotel provides catering for hotel events, and will even provide a brunch menu! Rooftop, brunch, wedding shower? Where do we sign up?! The Inn located adjacent to the Saratoga Spa State Park is a beautiful choice. Sitting on 4 acres of land inside the state park, you’ll feel as if you’ve been transported to a gorgeous countryside. Both indoor and outdoor accommodations are available. The brand-new, state-of-the-art banquet and conference facility is located just outside of downtown Saratoga, and perfect for your wedding shower. The ballroom can be configured to accommodate your specific requirements. On site event planners are there to help you plan every aspect of your special day. DYK: Our Majestic White 50ft x 50ft Tent is located on top of the largest event decks in the area! Feel as if you’ve been transported through time at the Mansion Inn of Saratoga. Public rooms, and bedrooms are furnished with fine Victorian antiques, catering to those with a taste for upscale and timeless decor. If this sounds like you, the Mansion should be your choice! This charming and historic space will cater to your every need, ensuring that your shower is everything you could have ever imagined! Set in the heart of Saratoga Springs New York, considered the gateway to the Adirondacks and walking distance from the Saratoga Race Track. The Inn at Five Points gives you exclusive use of the whole property for special occasions – the inn with 7 guest rooms each with private baths, bar area, wrap around porch cottage and an eating/dining room. All catering is done on site with menus created in collaboration with you for unique dishes that focus on local, fresh and sustainable farm-to-table food. Looking for something a bit more quaint for a smaller shower? Check out our list of bed and breakfasts, or see if your favorite Saratoga restaurant can host your party. This article was written by the Social Static team.